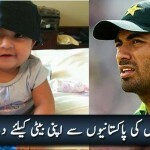 Pray for Wahab’s Daughter WAHAB RIAZ My daughter Eshal is going under a major surgery today. Plz do pray for her health n life. It’s a request.